So, those who have met me at the shop know that I, along with Jon, have been bitten hard by the permit bug. Frankly, they are tough to figure out, and tougher to land on a fly rod. 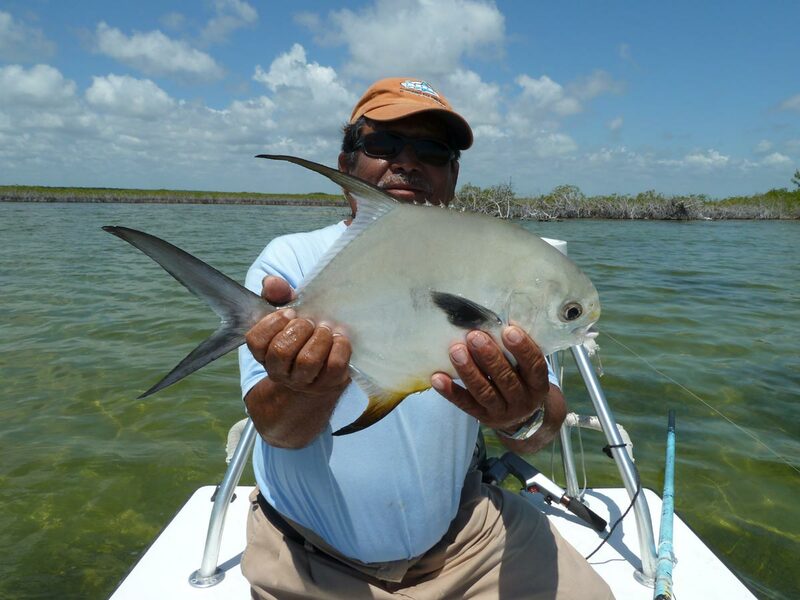 My 5th or so trip to Boca Paila Lodge in Mexico's Yucatan last week was planned late last year, and the thought of seeing a tailing permit or two got me through many months of work, family, and "urban existence". The first 3 days I was going to be guided by Victor, one of the lodge's more seasoned guides with over 40 years of experience. On the very first day, Victor put me on permit - both tailing singles, and traveling schools. In all of my trips there, I had never seen a school of permit, but witnessed three rather large groups of fish before lunch on the first day. Without build up or stress, one dumb hungry permit ate one of my crab flies on a decent cast, and 30 minutes before lunch, permit #6 of my young career was to the boat. "Crap, that was easier than I remember!" 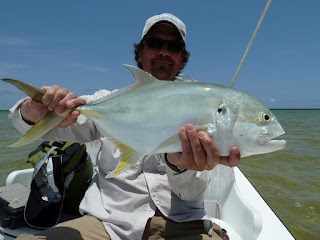 I would soon be haunted by my innocent musings, but day one produced a small, but never-the-less "fly caught permit". I had Victor who has smaller hands hold the fish so that you wouldn't see how tiny it was! Days 2 and 3 were strangely different. We saw permit, but very few in comparison to day one. No schools either, just singles and doubles. I made a few really tough casts, and although I might have impressed Victor and shocked myself, the permit seemed at best amused yet dis-interested. This continued shot after shot after shot. "Such is permit fishing," I reminded myself, "but what the hell was wrong with those shots???". It was interesting to hear the stories Victor told of fishing with Lee and Joan Wulff back in the day, of to hear first hand what the area was like 30 or 20 years ago before the road was built, and to learn how Victor ended up a fishing guide even though he was born in the Yucatan's interior and seemed destined to work in the mines near his home town. All great stuff, but the permit refusals mounted, and a nagging fear started setting in.... That's the thing about permit- they are evil geniuses - able to plant seeds of doubt and able to sabotage your best plans. The only clouds of the trip were found on the morning of day 4 and Alphonso suggested we look for snook. 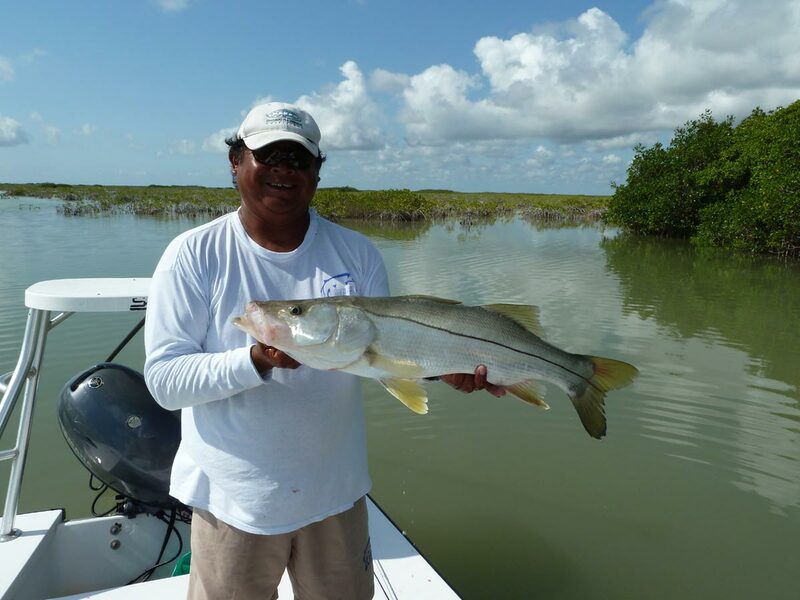 If you have never fished snook deep in mangroves, it really is one of the most exciting things around. 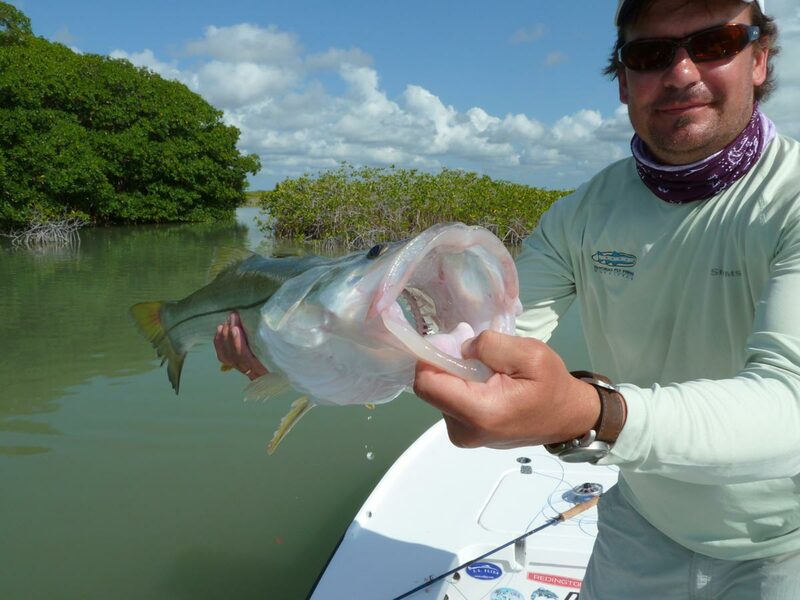 Unlike permit, snook eat flies with gusto. The trick is landing them before rods or leaders blow up. We landed a few right off the bat, we lost a few and a few blew things up. All in all, a great start! Things were looking up and I was having fun again! We saw permit, and a few really large permit, and again made some nice and some not so nice presentations. One actually ate, and I set the hook a split second too late to bury the hook. I can't tell you how many permit turned on my fly, charged it only to turn in disgust at the last second. We changed flies, we changed flats, I even changed my previously lucky hat. Nothing worked. 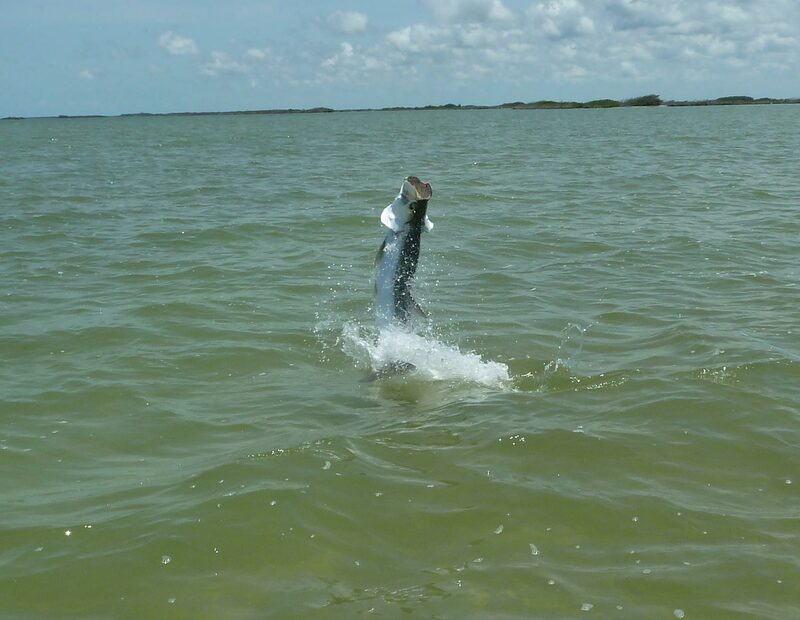 We saw and caught bonefish every day, we cast to some unusually large tarpon to no avail, but we both wanted permit. We tried, they refused. Simple as that. I did learn a lot from Alponso, and enjoyed his company and was blown away by his knowledge of the flats and lagoons. It was not to be as far as another permit, but the snook fishing was a gas and there was always the cold beer and Mr. Gonzalez's great cooking to look forward to. During dinner, I learned that my traveling buddy Mark hit a grand slam- and on his very first trip there!!! Finally somebody caught one I thought! I later learned that his permit ate his fly on an errant back cast - he wasn't hiding anything and was as shocked as he was amused. Neither he nor Victor even knew the permit was there. Such is permit fishing- but it counts- and he did it! Congrats! I really didn't let the permit get to me on that last day. Instead, we watched, learned and enjoyed the ride. 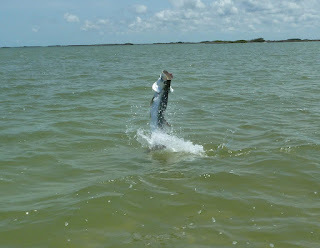 We did manage to get into some fish that were willing to play! Just off the permit flats, we rounded a mangrove island and saw several groups of laid up tarpon. Once again, something that I had never seen there before. The first shot I took was to an unusually huge fish for down there - probably 90-100 ponds in 3 or 4 feet of water. He didn't like the fly. Chico screamed "Jacks" and I had 20 seconds to drop the 10 wt and switch to the 8. The next shot was to a jack, and he ate. They tug pretty hard! 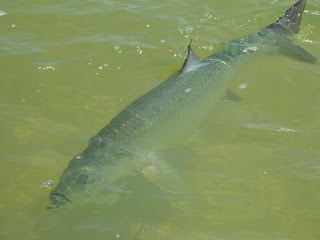 This one was tiny compared to the 15 to 30 lb jacks that we saw cruising the flats all week, but he actually ate.... I must say that the Sage One 8 Wt and the Ross F1 Reel make a deadly effective combination! That rod flat out casts, and the F1 Reel has an awesome drag and since both are so light, it feels like you are throwing a really powerful 6 wt!!! A 60 pounder struck first, and that one we actually landed. The next two were smaller fish that threw the fly after a few jumps. Chico got a few great pictures! We were laughing again, and I was reminded of what an incredible fishery this is.